Exceptional Grease Trap Cleaning Services. A-1 Sanitation has been in business since 1961 and provide technicians that are courteous, well trained, and take pride in their work. We are the Pros and we’ve seen it all. Grease traps can be a problem for any restaurant if they don’t service them regularly. The last thing a restaurant owner needs is a grease trap backing up during business hours. They can be a smelly and costly nuisance. A-1 Sanitation specializes in restaurant and industrial grease trap cleaning. We offer outstanding service with a proven track record. A-1 Sanitation can set your company up on a time and money saving preventative maintenance schedule. Unlike some competitors who just skim the grease off the top, we thoroughly clean your entire trap. Our 3000 gallon trucks are equipped with 2000PSI pressure washers that strip the grease from the walls and we have experienced drivers to get the job done right. If emergency service is needed we will be there in a timely manner to get your trap flowing again. A-1 Sanitation serves Northeast Texas and Southeast Oklahoma. We dispose of all grease trap waste according to TCEQ and DEQ guidelines. We provide a completed manifest to each customer and haul the grease to a fully permitted disposal facility. 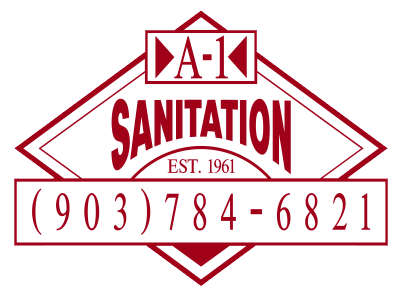 Contact A-1 Sanitation today for expert help with all your septic tank, portable toilet, grease trap, and pumping service needs in Texas and Oklahoma. Serving Paris, Sulphur Springs, Bonham, Mt. Pleasant, Allens Chapel, Ambia, Allens Point, Adilou, Annona, Atlas, Arthur City, Avery, Brashear, Bagwell, Bailey, Belk, Ben Franklin, Biardstown, Birthright, Blossom, Bogata, Boswell, Boxelder, Broadway, Brookston, Carson, Caviness, Charleston, Chicota, Clardy, Clarksville, Negley, Commerce, Cooper, Cumby, Cunningham, Cuthand, Como, Campbell, Dekalb, Demple, Deport, Detroit, Dike, Dodd City, English, East Post Oak, Lamar County, Emberson, Enloe, Fulbright, Faught, Forest Chapel, Fort Townson, Garrett Bluff, Georgia, Gadston, Givens, Glory, Globe, Hagansport, Talco, Harmon, Honey Grove, Hopewell, Howland, Hugo, Grant, Ivanhoe, Jennings, Johntown, Kanawha, Klondike, Kiomicita, Lamasco, Ladonia, Lanis, Lake Crockett, Lamar Point, Lake Creek, Leonard, Lydia, Lone Star, Millerton, Manchester, Marvin, Maxey, Milton, Minter, Monkstown, Mt. Vernon, Mt. Pleasant, Negley, Noble, Novice, Paris, Powderly, Pattonville, Pecan Gap, Petty, Pinhook, Post oak, Reno, Ragtown, Rawhide, Rosolee, Ravenna, Rockford, Roxton, Rugby, Sawyer, Self, Slabtown, Slate Shoals, Sulphur Springs, Sumner, Sulphur Bluff, Sun Valley, Sylvan, Saltillo, Swink, Spencerville, Taylortown, Telephone, Talco, Tigertown, Tira, Toco, Trenton, Unity, Viewpoint, Weaver, Windom, Wolfe City, Woodland, Whitewright, Winnsboro, and Valliant.